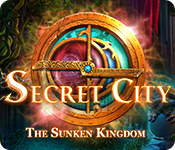 Secret City: The Sunken Kingdom is rated 4.3 out of 5 by 4. Rated 5 out of 5 by biscuitsmama from SECRET CITY IS BACK WITH AN EXCITING ADVENTURE INTO THE MERFOLK REALM The Secret City is a magical place where mystical and powerful beings live hidden alongside the human race. Many years ago Tenebris, the princess of the Merfolk, killed her father to take over the Merfolk kingdom. The ambitious princess had her sights set on the Secret City as well since she wanted to become the supreme ruler of all mystical beings. Fortunately the revolt was stopped and after her generals were killed Tenebris and the Merfolk Kingdom disappeared. Now the petrified body of a renowned Dwarven explorer has washed up on the shoreline and your friend Sakir needs your help. Sakir believes that the death of Bolrekin Nibley is somehow related to the Merfolk Kingdom and it could mean bad news for the Secret City. Will you and Sakir be able to solve the case and find out what this means for the future of the Secret City. I loved the first game in this new series “London Calling” that was released last year and since that time I’ve been waiting for the next game to appear and today my wait is over. I played the beta for the game a few months ago and I knew it would be a game that I would love. The Sunken Kingdom is everything I thought it would be and more. The only issue for me is that there are far more puzzles than HOP scenes in the game. The HOPS in the game are very well-crafted but they are outnumbered by puzzles. 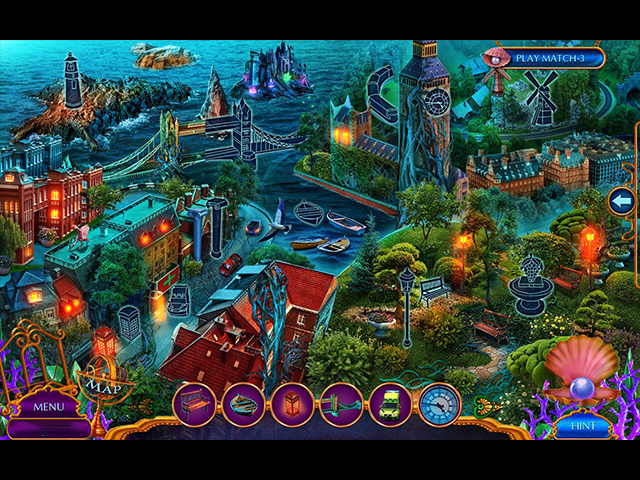 Even though I enjoy HOPS more than I do puzzles, the puzzles in this game are entertaining and fun to solve. Thankfully there are some puzzles that rely on using one’s brain rather than simply twist this and then twist that to solve. Another critique of the game is the offering of a pseudo Custom game setting. If a developer is going to offer a Custom setting it implies that the gamer can choose to set the game up the way they want to play. 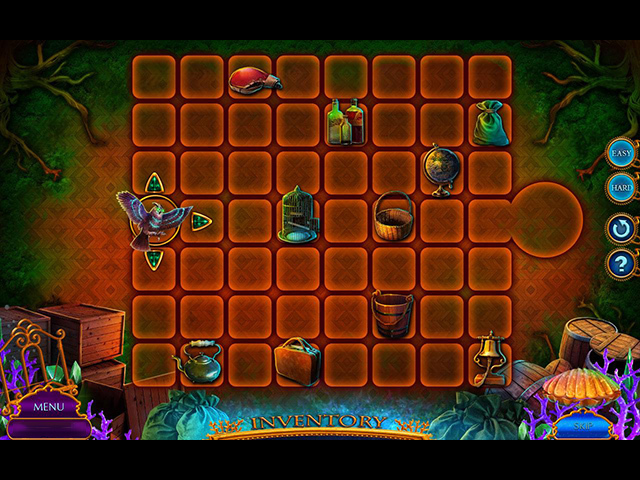 In recent games the developer sets the lower end of the time settings for skipping puzzles or getting hints. Sometimes it might be 10 seconds or even 15 seconds but I believe that the gamer should be able to change that to fit their needs. I tend to be a bit impatient and when I want or need a hint I don’t want to hang around and wait. Please developers allow us to select that bottom range for ourselves. I realize it is a time-stretcher when we must wait to skip a puzzle but why even offer a Custom setting when we cannot set the hint and skip times? 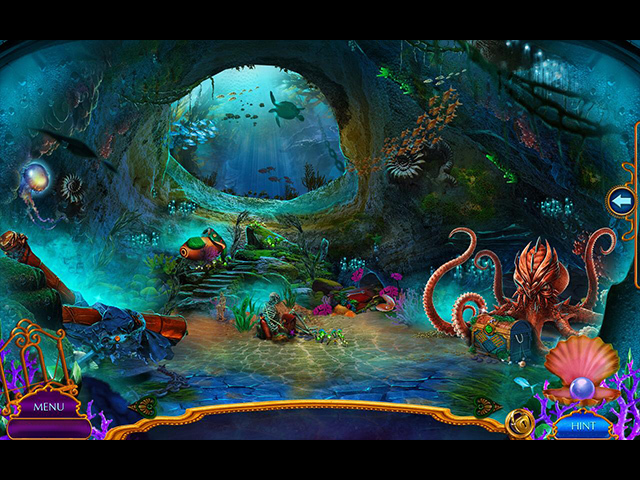 Overall The Sunken Kingdom is an excellent game with a well laid out storyline. I love the premise of having a hidden city within London that only a few can see or find. Kudos to BFG and the developer for coming up with this interesting new idea. I have enjoyed playing the game well into the wee hours of the morning and find it to be one of the best games that I have played recently. It was refreshing to see a mystery game that didn’t have some evil monster hiding in a decrepit and dark haunted house. As always, I recommend that you try the demo to see if Secret City the Sunken Kingdom is a game that you will enjoy as much as me. Happy gaming! Rated 4 out of 5 by catmartie from Fairly entertaining Having played the free trial, I liked the game enough to buy it on special offer, but not to use a precious full credit on. It's good but not brilliant; pleasant entertainment to spend time on after a few days of intensive personal business matters. The story line is a bit flimsy but is a useful vehicle for finding and solving a succession of games and puzzles. One thing that really jarred, and I was glad to get past that sequence, was the voice for the character "Nessie". Now Nessie is a Scottish mythical creature, so-called because it's believed to live in Loch Ness. In this game however the character has an extremely grating and unpleasant "Mockney" accent.